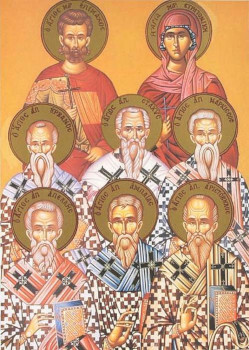 The Holy Disciples from the Seventy, Stachys, Apelles, Amplias, Urban, Narcissus, And Aristobulus. The holy Apostle Andrew the First-Called ordained Stachys to the dignity of bishop of Byzantium, where he was bishop for sixteen years, zealously preaching the Gospel of Christ and converting pagans to the true faith. Saint Amplias was bishop in the city of Diospolis. Saint Urban was bishop in Macedonia. They also were bishops by the consecration of the holy Apostle Andrew. For preaching the Gospel they were put to a martyr’s death by Jews and pagan Greeks. Saint Narcissus was bishop in the city of Athens. Saint Apellias was bishop at Heraclium. Saint Paul made Saint Aristobulus a bishop and sent him to preach the Gospel in Britain, where he converted many to Christ.